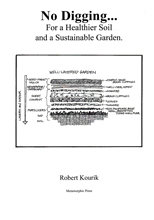 Order Drip Irrigation, Gardening, Landscaping and Cooking Books by Robert Kourik, Plant root information too! All landscape, garden and drip irrigation books include free shipping, handling and TAX on all orders! (In the 48 USA states only, all others by agreed upon costs.) 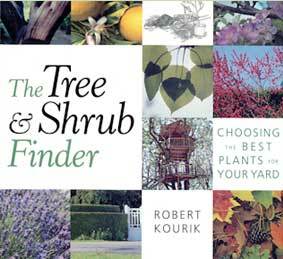 ALL books signed by Robert Kourik if you choose (see details below). To Order books, you can use the PayPal links below to pay with your credit card. Buy at the Source, so writers can keep on writing! Please note: Your Paypal Cart will open in a new tab. 1) Figure out which edibles to raise, with the most care-free varieties. 2) Lay out your garden for food, relaxation, and play. 3) Cultivate healthy self-sustaining soil for the future. 4) Attract the best pollinating and beneficial insects. 5) Choose the right plants for your landscape, climate, soil, and water supply. The bloom cycle of 191 plants is presented. 13 beneficial insects are listed. 117 plants have notations of which of the 13 beneficial insects the flower attracts. There are 30 full citations for further reading. It will also inform you on how to choose the best plants to lure beneficial insects outside of the window of midsummer bloom. Because so many beneficial plants bloom in midsummer, that time of year is a banquet of blossom for helpful bugs. Since pests don’t magically disappear in the spring and fall, this chart will help you choose the plants that will bloom in your garden during the “in-between” seasons. 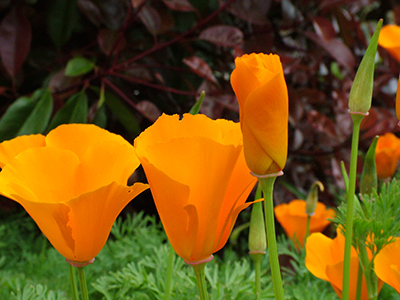 Most of the bloom periods came from www.Calflora.org which is, as would be expected, Californiacentric. Some are from the Missouri Botanic Garden database. With careful observation, you will see how your garden blooms react to the seasons and "slide" the bloom-period bar on the chart toward Spring or Fall. This book uncovers one of the greatest mysteries of the underground—the secret lives of roots. 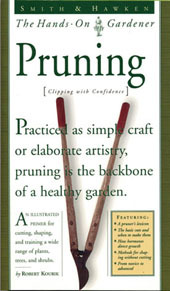 Illustrated with 140 enchanting and revealing root drawings by horticulturalists literally working in the trenches, it’s a superb guide to raising better trees and shrubs and growing abundant fruits, vegetables, and flowers. Among other science-based secrets, you’ll learn how to apply mulch, fertilizers, compost, and water for the most abundant growth. With eighty percent more new information than the best-selling Roots Demystified: Change Your Garden Habits to Help Roots Thrive, this is NOT a revised edition—it’s a whole new book. To purchase an author-autographed book click the button at bottom of page. Now available as a downloadable eBook for $15. Click the button below to purchase and a pdf will be emailed to you. Sunset Magazine: “Robert Kourik is crazy about roots. Yet Kourik’s purpose isn’t to amaze you, but to instruct. 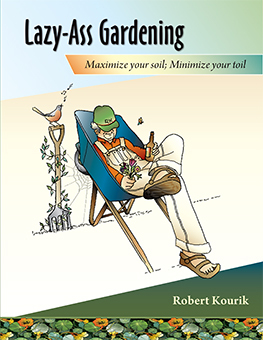 To that end, the book is filled with practical tips for gardeners…I recommend this as a standard reference.” Jim McCausland, Sunset’s senior garden writer. 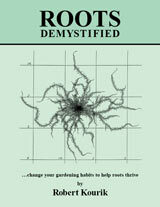 Roots Demystified is the only book in print for gardeners with such an extensive variety of root illustrations. (Hey, you can get a totally boring, very technical book for $200, but it doesn’t even have as many vegetable drawings.) I’ve got 16 detailed, awesome illustrations from asparagus to tomatoes, and many in between. And illustrations of the roots of seven fruit trees. This is a great companion for my Drip Irrigation book. Now available as a downloadable eBook for $12. Click here for details. Sunset appreciated the only fun book on plumbing (i.e. drip irrigation). You will love it too. 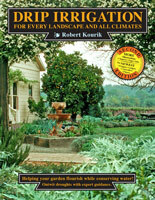 The book explains how to promote the growth and flowering of all plantstrees, shrubs, and container plantsin Every Landscape and All Climates using drip irrigation. (Déjà vu. The subtitle of the book.) Also, how to avoid picking the wrong “stuff,” so you don’t easily feel overwhelmed. Now available as a downloadable eBook for $12. Click here for drip irrigation ebook details. This is an eBook (PDF) for only $10.00! Once you purchase with our easy PayPal checkout system, the ebook will be emailed to you in its entirety. Old-fashioned fighting swords cut in both directions. The irony is you didn’t know when the other side was coming. All gardening techniques and assumptions have a double edge. One we expect and the other side comes as a surprise. Sort of like two sides to a coin. One side remains hidden until revealed. In reality, positive approaches to gardening can have hidden detrimental consequences. Likewise, so-called harmful garden concepts often have a germ of the positive. growing, you really won’t be growing. 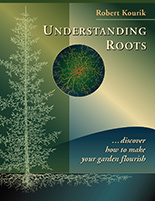 This book will shed light on those myths and assumptions and get you thinking about new approaches to gardening. This is an eBook (PDF) for only $6.00! Hey dripologists, wanna see how drip irrigation increases yields? First, read how the scientific literatureboring, but still fascinatingproves that, in spite of reducing water, vegetables yields go up. Nearly 100 vegetable, nut and fruit examples in 34 citations from climates throughout the country and world. Enough examples for you? You’re gonna believe it’s true. It’s even shown that yields can be up to 48% greater with drip irrigation than other methods of irrigation. Cool, no? You can learn why roots love drip irrigation moisture. Believe it or don’t, but I think you’ll learn how it works. You can also learn why so many of the soil’s critters love the upper levels of the soil. Maintaining healthy bacteria, microbes and other soil life equals greater yields. So peruse this eBook on drip irrigation of your veggies. It’s cheap. 78 pages of great information as a PDF that you can take with you on your iPad, laptop. Buy now and the PDF will be sent to you via email - only $6 - six bucks American! Dr. Judyth McLeod was the head of landscaping in a leading Australian university for thirty years. She is the most thorough and scientific garden writer in Australia. Click here to read the entire review. • Available as an eBook only. Mother Nature didn’t bend over much to make soil. Nature builds soil from the top down. She doesn’t dig and invert soil. 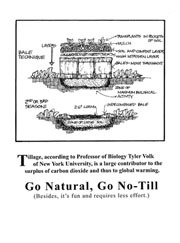 This handbook is an introduction to No-Till gardening. It also includes a word about surface cultivation with the top two-three inches of soil skimmed, but no shovels used. This is a great stepping off handbook to an increasingly exciting way to garden. It can be easier on the backs of aging baby boomers. Includes permanent garden beds that thwart pesky gophers. Also includes a page of references. Great companion to my drip irrigation book. Now available as a downloadable eBook for $3. Click here for details and ordering. 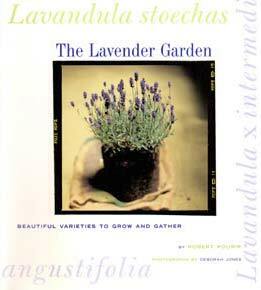 Buy this with my drip irrigation book for a high yielding and beautiful garden! Order past issues of this newsletter produced by Robert Kourik. Use this button to pay an additional amount such as overseas shipping. You can use your credit card and fill in the amount when you get to Paypal. All book purchases include an (optional) personalized message from Robert on the inside title page. After ordering your book(s), click on the button to the right to send your requested message. Please include your name and the title and date of your book purchase. OR you will see a link in your PayPal check-out that says "Add personalized message" Click on that and type your desired message.